The budget traveller can only imagine what it is like to fly business class. 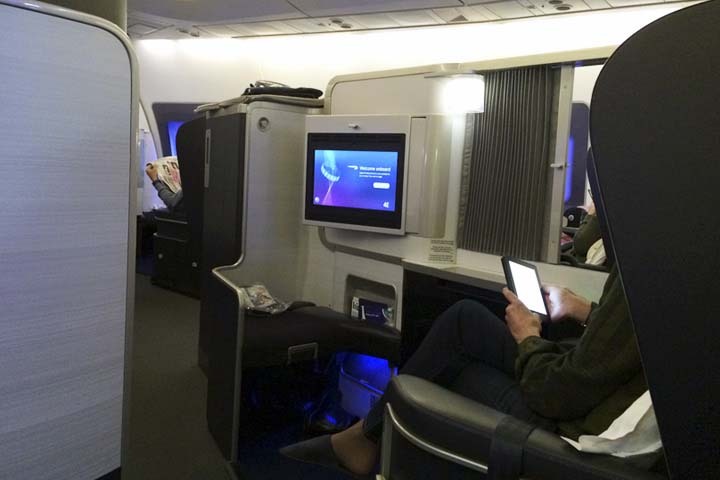 Flying in business or first class with British Airways is an incredible trip and I feel lucky to have experienced it. The biggest perk is the comfortable seating, especially if flying long haul, so you can get a good quality sleep and you don’t leave the plane achy and grumpy. The second greatest perk is the unlimited champagne. Of all the airlines I have travelled, I love British Airways for its consistency in food and beverage and the great service. When you fly business class you are treated like a VIP. Your luggage is labelled priority so it arrives first on the carousel at landing. You also get to join the quick priority queues for check-in and immigration. Whilst waiting for boarding, business class passengers are entitled to relax at the business class lounge. Each airline will have its own lounge but they all similiar facilities such as access to bathrooms and showers (with free toiletries provided), wifi internet, couches and desks to plug in your laptop. They also have a drinks bar that has a selection of red and white wines, bubbly (the better lounges will have champagne rather than prosecco), beer, whisky, scotch, brandy, vodka, gin and a few liqueurs. 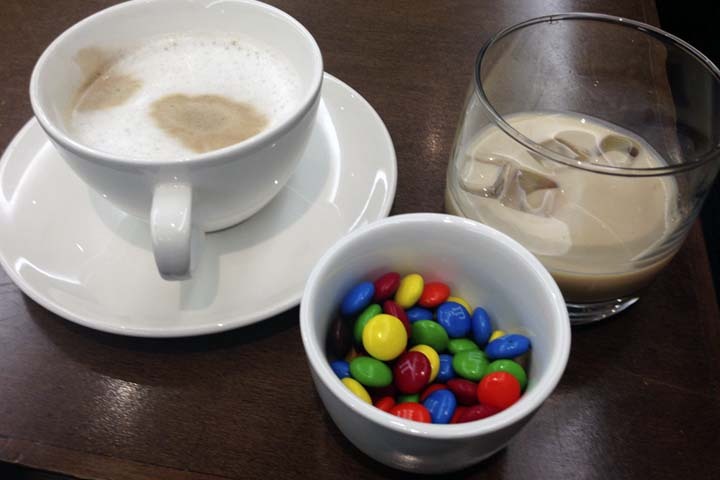 I usually take the opportunity to drink lots of Bailey’s, which is always a popular choice for passengers, and its not uncommon to see travellers pouring themselves big glasses filled to the brim of this delicious. For those who prefer to stay sober, there will also be a good selection of non-alcoholic beverages such as mineral water, juices, hot chocolate, premium teas and coffee. There is also a food buffet with light snacks from noodles, sandwiches, cheeses and crackers to fresh fruit, chocolate and pastries. When it is time to board the plane, business and first class passengers are allowed to go first. As you settle in your seat and await take-off you are offered a glass of champagne or orange juice and are provided a food menu and wine list to browse. 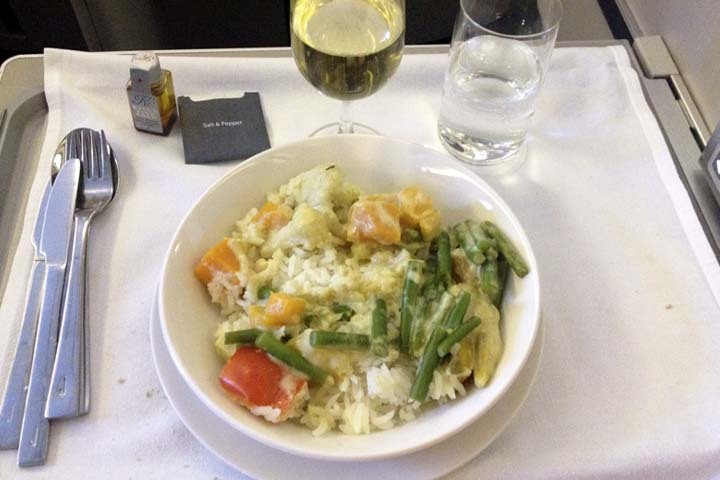 When the flight has taken off and the seatbelt sign is turned off, your steward will then proceed to take your order for the meal and you can choose an appetiser, main course and dessert as well a beverage. Your meal will be served in china crockery with real cutlery and a cloth napkin and likewise your champagne or wine will be served in a proper glass. 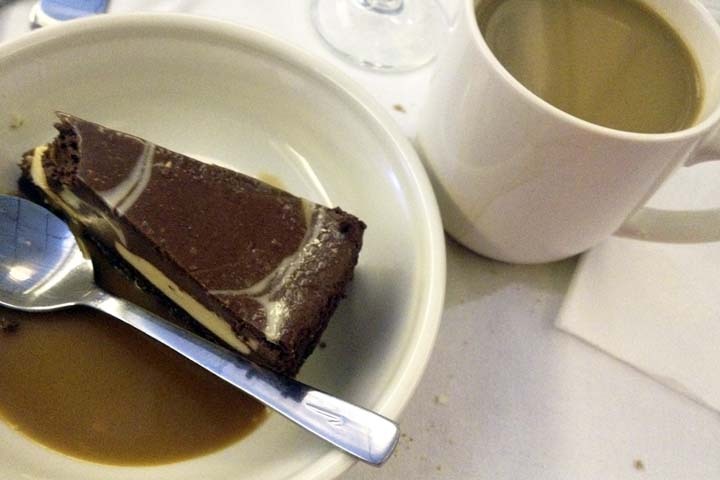 I am not a fan of airplane food and I usually skip the meal, or just eat the bread with butter. The air hostess offers a selection of hot breads at the start of the meal such as panini, olive bread, baguette, garlic toast and other baked treats, which typically taste amazing. 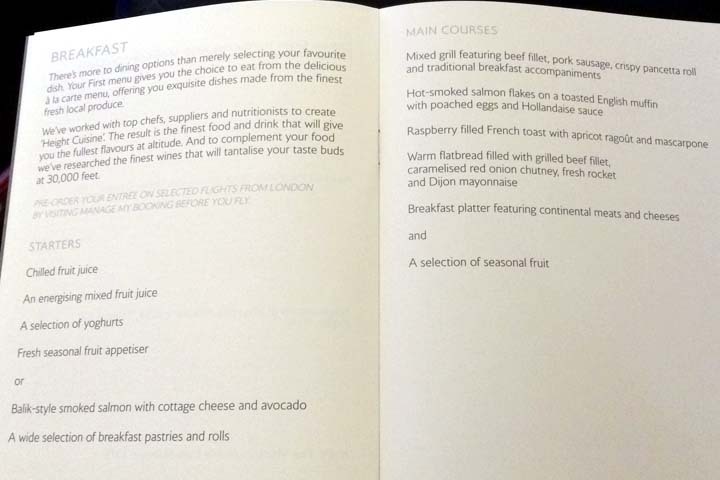 Occasionally I will partake of a meal on business class if the menu is enticing enough. Once I had a tasty vegetarian risotto that came with string beans, butternut pumpkin and a creamy consistency. The desserts are always very good. My top dessert experiences include ice cream sundae where the chocolate fudge topping was served hot from the ice cream trolley, as well as a rich and velvety chocolate mousse cake. Once you have finished your meal you can sit back and watch a movie. There will be a large screen monitor that pulls out of the back of the seat, however on some aircrafts you will be given a tablet with headphones instead. The selection of entertainment is the same as offered in economy and first classes. In business, the seats are very comfortable and they recline completely flat if you prefer to sleep. 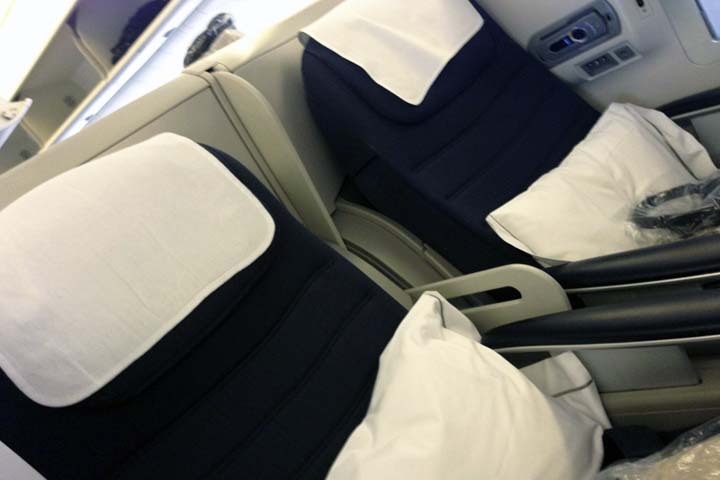 The British Airways blankets are beige and blue quilted and super cosy, ensuring you have warm and pleasant sleep. First class is not significantly different from business class on British Airways. 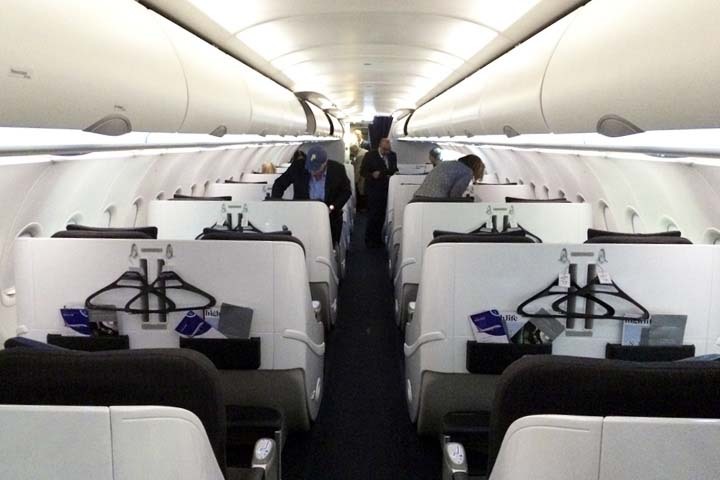 I recently flew first class travelling from London to New York. The biggest highlight was the single aisle seating, so no matter where you sit you always have access to the aisle and plenty of leg room. As in business class, the seats can be adjusted to lie flat if you wish to sleep. Upon arriving you are offered the customary glass of champagne or orange juice and a newspaper. We also received a little goodie bag with hand cream, face moisturiser, a toothbrush and toothpaste, socks and sleeping mask, as well as some British Airways branded cotton pyjamas and slippers. There were also several soft pillows in the compartment. I also requested a blanket and was disappointed they only had thin blankets that were not very warm. The menu on my particular flight was average. 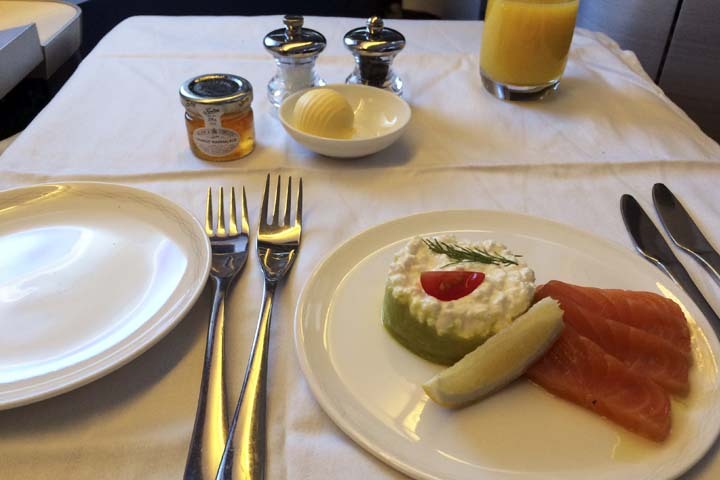 However it was a morning flight and breakfast is always the worst airline meal. I ordered a salmon and cottage cheese bagel to begin with, which I didn’t enjoy as the quality looked suspicious with an unexplained black dot on my salmon. I then had the raspberry french toast for my main course, which was okay although the raspberry filling was very sweet. 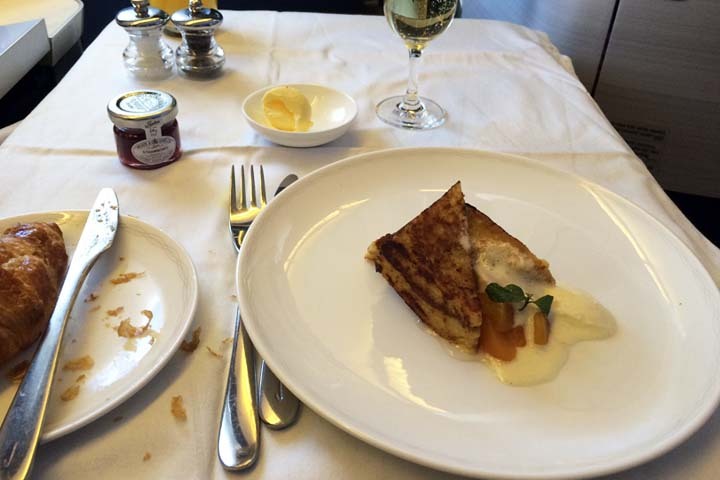 But as always, the warm complimentary bread with butter served throughout breakfast was scrumptious and I drank plenty of champagne with my meal, which enabled me to sleep well for the remainder of the flight. Without a doubt, the best flight I’ve ever had was the British Airways Club World flight from New York to London City Airport (via Shannon). This is a single class service, only for business class passengers and it seats just 40 people. Inside the plane is very quiet and spacious and the customer service is top notch because there are less travellers to attend to. You also spend an extra 1 hour commuting than typical when flying back from New York, which means a little extra sleep if you’re taking the red eye and need to go straight to meetings on landing. 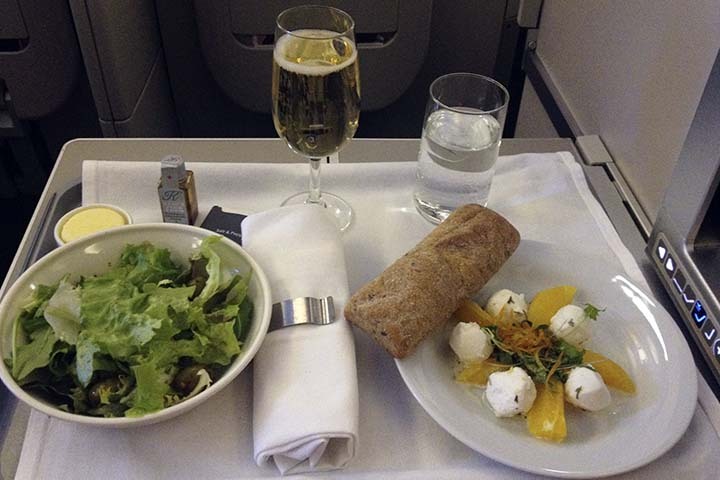 When all is said and done, does it matter what it is like to fly business class or first class? It is a lot more expensive than using a budget airline and which makes us ponder whether the journey or the destination is more important. If you think about it, money saved on flights can go towards hotels and attractions upon landing. What do you prefer?